The early Egyptian priests evolved a creation myth, or Cosmogony, to explain how some of the Gods and Goddesses came into being. The early Egyptian priests then evolved a Family tree, the relatives of the main Egyptian Gods, like Anubis, to explain how some of the Gods and Goddesses were related. Anubis was the son of two of the Gods ( Osiris and Nephthys) who feature in the Ennead. The Ennead was the collective name given to the nine original deities (Gods and Goddesses) of the cosmogony of Heliopolis (the birthplace of the Gods) in the creation myths and legends. In these myths the God Osiris is murdered by his brother Seth and his body scattered in fourteen pieces. The pieces are collected by the Goddess Isis, helped by her sister Nephthys, and Osiris is resurrected for just one day. Anubis was believed to be the son of the God Osiris and the Goddess Nephthys. Anubis embalms Osiris, making him the first mummy. 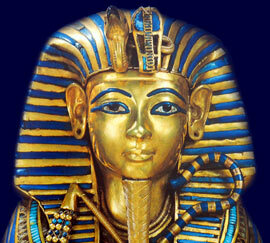 The Egyptians believed that a physical body was essential for an eternal life for the deceased. Without a physical body the soul had no place to dwell and became restless forever. The Egyptian God, Anubis, was therefore seen as the God of the Dead, Tombs and Embalming who admitted the dead to the Underworld and was the subject of the prayers at funerals. The priests who officiated at the 'Opening of the Mouth' burial ceremony wore a jackal mask emulating Anubis. The Egyptian Gods or Goddesses, such as Anubis, were often depicted as being part human and part animal. In the description of the Egyptian God Anubis he / she was most frequently depicted with the body of a human and with with the head of an animal - a Jackal. In the Ancient Egyptian religion certain animals were seen as sacred as they believed that the Spirit of a God resided in these animals, such as the Jackal, which were revered and worshipped as reincarnated Gods during their lifetimes. In the legends and myths of the Ancient Egyptians Anubis is seen as the God of the Dead and Anubis had an important role when dead Egyptians entered the Underworld on their journey to the Afterlife and paradise. The Underworld was called Duat and believed to be full of great dangers. Anubis greeted the souls in the Underworld and protected them on their journey. The Egyptians were also accompanied by guidebook known as the Book of the Dead which contained spells and instructions to ensure safe passage through the dangers of the Underworld. The final place in the Underworld was the Judgement Hall where the Court of Osiris decided on their fate. Anubis the God of the Dead would lead the dead in the Underworld at the Hall of Two Truths to a set of scales where his or her heart was weighed against the feather of truth and their fate would be decided - either entrance into the perfect afterlife or to be sent to the Devourer of the Dead. The Temples dedicated to Anubis, the God of the Dead, Tombs and Embalming, were believed to be the dwelling place of this famous Egyptian God. Only the Pharaoh and the Priests of Anubis were allowed inside the temple and the priests would undergo ritual purification in a deep stone pool before they entered the Inner Sanctum of the Temple. This not only cleansed them but also gave them contact with the primeval moisture of life. Ordinary Egyptians were only allowed to come to the gates, or forecourt, of the temple of Anubis to pay homage and offer gifts to the God / Goddess. The Priests of Anubis would collect the gifts and say prayers on behalf of the person in the confines of the temple. The priests of Anubis, the God of the Dead, Tombs & Embalming, would conduct ceremonies, sacrifices and chant magical incantations, sometimes referred to as spells. The temple of Anubis would consist of heavy gates which accessed a massive hall with great stone columns, and then a series of many other rooms through which processions of priests would pass. These rooms, or chambers, were lit by candles and incense would be burnt to purify the air of the Temple. The chambers gradually decreased in size, the lighting in the temple was deliberately and significantly reduced to create an atmosphere of deepening mystery until the priests reached the chapel and the shrine which contained the Naos. The Naos was the stone tabernacle inside the shrine which housed the great Statue of Anubis, the God of the Dead, Tombs and Embalming. The large statue of the God Anubis, the God of the Dead, Tombs and Embalming was situated in the inner sanctum of the Egyptian temple. The statue of Anubis would have been depicted with the body of a man and the head of Jackal. This sacred statue, in the dwelling place of the God, was the embodiment of Anubis. Food and drink would be offered to the God. The High Priest of Anubis, would conduct ceremonies and offer prayers and incantations but there was another important priest, called the Medjty, who was responsible for the toiletries. The statue of Anubis would have been washed and oiled. The statue was then dressed in fine linen and eye make-up, powder and rouge was applied and sacred oil rubbed on the forehead of the statue. The statue of Anubis, with its head of the Jackal, was only seen by ordinary Egyptians at important festivals when the effigy was paraded in magnificent processions. Each section addresses all topics and provides interesting facts and information about the Golden Age of Pharaohs and the famous Gods and Goddesses of Egypt. The Sitemap provides full details of all of the information and facts provided about the fascinating subject of Egyptian Gods and the Pharaoh Tutankhamun!